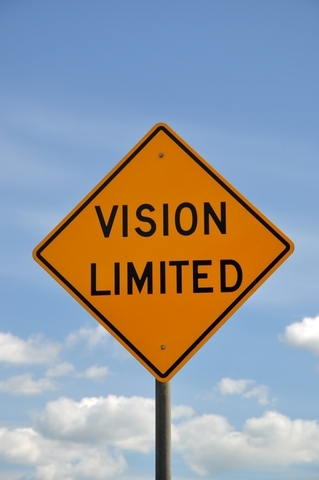 For both churches and individuals, there is a difference between a good-sized vision and a God-sized vision. Which do you have? Great story about this in Acts 1. With this, the most significant revolution this world has ever known or will ever know was begun. The church was born. Your local body of believers and my local body of believers (and every local church around the world) all call ourselves followers…soldiers in this revolution. But the question this passage raises in my mind is this: am I an Acts 1:6 follower or an Acts 1:8 follower? Additionally, which is my church? These disciples had an impressive vision…one found in scripture and supported by nothing short of a promise from God: they envisioned an Israel no longer under Rome’s thumb nor its puppet governors…an Israel who once again was on top of the world, boasting strength and numbers and the support of the sovereign God of Abraham, Isaac and Jacob. It was a grand vision. It was a glorious vision. But it was a small vision in Jesus’ eyes, one which fell embarrassingly short of what this revolution was all about. They had a vision for changing Israel. Jesus had a kingdom vision for changing the world. Forever. An Acts 1:6 vision is like that. It is when I believe big things for me and for my ministry and for my church. It is when I believe in a God who wants me to be rich in material possessions and free of sickness or injury and living easy. An Acts 1:6 vision for my church is when I believe we will make budget this year (and more) and we will get that new sanctuary built and we will make it through this season of conflict or that season of dwindling numbers. An Acts 1:6 vision is what I get when I seek after God’s will for me or after God’s will for our church. It is big enough…and faith-filled enough. But it is woefully off the mark in terms of the kingdom. In Acts 1:8, Jesus casts a vision bigger and more impactful than any of the disciples had in mind. Even years later, they would not fully grasp the fullness of the vision, as they debated Paul’s and Barnabas’ taking of the gospel to the Gentiles. An Acts 1:8 vision doesn’t ask what is God’s will for me? It simply asks what God is doing and then seeks to align with that larger, kingdom-oriented vision. An Acts 1:8 exploration of God’s will does not start with me or with my church and work up toward God…it starts with God and works out into the world and then explores how I (or my church) can join that vision. So, do you think Dr. Luke got a bit of a chuckle as he wrote this portion of Acts and recorded how embarrassingly small those early disciples’ vision was? I wonder how God’s people will look back and remember our vision today? This entry was posted in Discerning God's Will Together, leadership, strategic planning, The Church's Influence, the revolution and tagged Acts 1, apostles, Christianity, church, disciples, God, Israel, Jesus, kingdom, Luke, revolution, Rome, vision on September 10, 2013 by Blake Coffee.